With the release of the new, refreshed Nissan LEAF getting closer by the day, doing a comprehensive comparison of the two would make some sense — to help those interested in getting a Nissan LEAF decide between waiting for one of the refreshed ones or simply getting one of the current offerings now available at low price points. Since Push EVs has already beat me to it, though, I’ll just go ahead and highlight some of the points made over there, while adding my own thoughts. … plan to next buy a Nissan LEAF. Whether that would be a current-gen LEAF or a next-gen LEAF, we didn’t ask. With regard to pricing, that remains something of an unknown, but it would stand to reason that Nissan will be looking to remain competitive in that regard with the Hyundai Ioniq Electric (which will be getting a range upgrade next year) and with Kia’s soon-to-be-released electric models. This would entail undercutting the Tesla Model 3 and Chevy Bolt on pricing and aiming for strong “value for the money” appeal. This is all speculation, though — Nissan may stick to its current pricing structure, and could possibly lose sales to Hyundai and Kia as a result. That would represent a big change in design, though one that the company has probably been working towards for a while now. 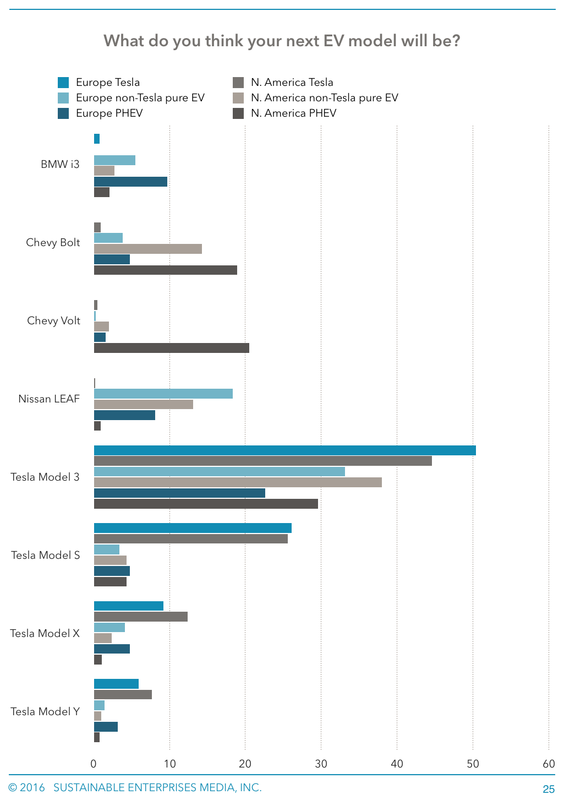 Presumably, after all, that’s why the company has been hesitant to increase the size of the LEAF’s battery-pack too much to date — because of the need to add a thermal management system if that happens. So, what’s the overall takeaway of the comparison? As always, it depends on the factors given the most weight. If you want a comparatively conventional-looking car, then wait for the new LEAF. If you don’t care about that, then the current LEAF can be bought fairly cheaply. If you need a higher range than the current LEAF offers, then wait. If you live in a city where everything is close together and you also have a garage where you can charge overnight, then maybe buy one now … etcetera. 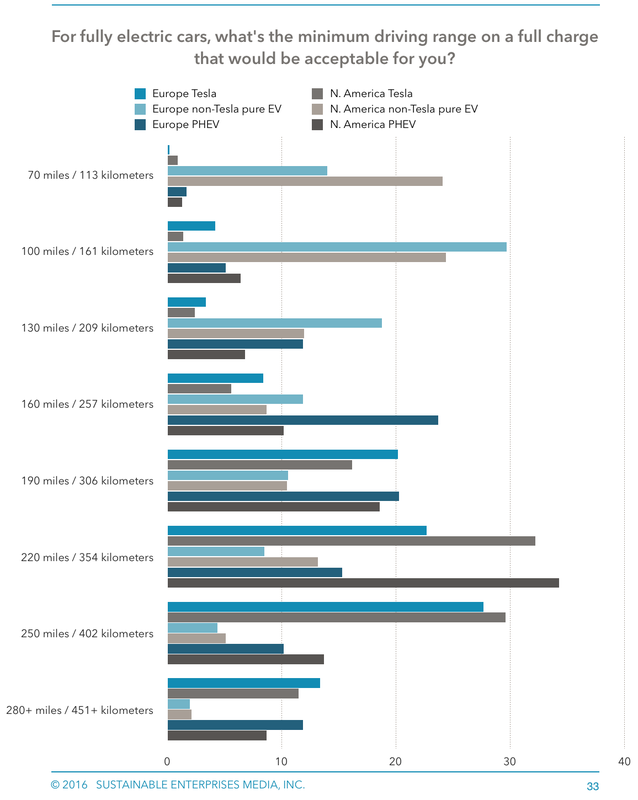 Another finding from our just published 93-page EV report is that many EV drivers consider 130 miles or less range to be adequate for their needs. That means they don’t really need to wait for a long-range LEAF or Model 3. There’s one more thing to note, however: the new Nissan LEAF will reportedly feature the company’s new ProPilot semi-autonomous driving tech — which will reportedly allow for fully autonomous single-lane highway travel. Remember, that’s a tech our research indicated a lot of today’s EV drivers want. People who place high value on fully autonomous highway travel — those who commute long distances for work everyday, travel for work a lot, etc. — may well want to wait for the new LEAF. That said, if you commute long distances regularly, then maybe the Nissan LEAF isn’t for you, as there isn’t really much in the way of a national electric vehicle fast-charging network in the US yet. As we reportedly previously, though, as a result of its settlement with the US government in relation to the diesel emissions cheating scandal, Volkswagen will be over the next decade or so building out a decent network — from the sounds of it.